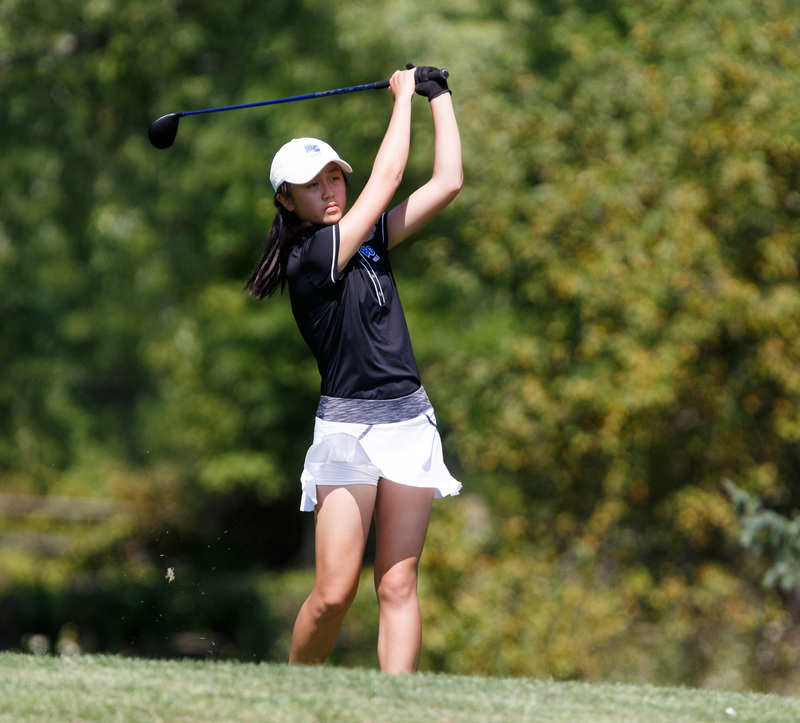 Brookfield Central senior golfer Sophia Sun spent the past two summers practicing her craft at - the Massachusetts Institute of Technology. While the rest of the prep golfers from all over the state spent their summers on the golf course, sharpening their game, Sophia has spent the last three summers, including the last two at MIT, studying Neurosciences. "I haven't spent a summer at home the last three summers," Sun said. "I was at a math class in Texas and then two summers at MIT. I did research in Neurosciences at a Harvard lab. It did take away from my game and I wasn't able to practice as much when I was there, but it was a really great opportunity." Photo by Alan Herzberg, SportsPhotos LLC --- Brookfield Central senior Sophia Sun spent her last three summers away, including the last two at MIT studying Neurosciences. Sophia talked about her slow starts for the Lancers the past few years. "My first or second mini-meet I had my highest score - which was a 47. The rest of my scores were 40 and below. It was hard to get in that round because I wasn't used to being in a competitive setting. Even when I did get to hit balls over the summer - it was at the range not on a course." Coach Brian Scrobel talked about Sophia's adjustment when she returned home at the end of the summer. "It was a difficult thing for Sophia the last two years - she's brilliant in the classroom - and spent time in Massachusetts at MIT at these match camps," he said. "That has taken a lot out of her golf preparation. When she is in the classroom in the summer, most of the people are working on their golf game. "She always has to play catch-up. Last year when she came back her practice was accelerated for her to get back into 'golf shape.' It happened this year. She struggled a little, but we got her back to that comfort level and she's certainly done a nice job of getting comfortable again. Despite her slow starts, it didn't effect Sun's overall performance the last four years. She earned second-team All-Greater Metro Conference her first three years (2014-16) and she earned first-team all-conference honors this fall. During her career the Lancers won the GMC Championship all four years and also qualified for state (3rd, 6th tie, 7th, 7th) with Sun a member of those teams. This year she tied for 18th with 81 first round and tied for 23rd with an 87 for an overall score of 168. Playing all 18 holes she was with 51st with a 184 last season. She only played the first 9 holes her first two years at state. She tied for 73rd with a 100, splitting her appearance with Alyssa Borowski (110) her freshman season (2014). In her sophomore year (2015) she was 71st with a 99 on the first 9 holes, teaming up with Alex Lee (106). Like a lot of athletes, Sophia first got exposed to her sport through her father (Jian). "My dad was so involved in golf and I would just go the range with him," she recalled. "I would grab the 7-iron - and that's all I would hit - his big steel 7-iron." Scrobel first met Sophia at Wisconsin Hills Middle School. "We had a golf unit in phy ed and she had a pretty natural golf swing," he said. "We kind of talked about whether she had played golf before - and she hadn't - she was a swimmer in middle school. A lot of power comes out of that 5-foot, 4 inch frame. "Technically, my long game (is my strength)," Sophia said. "I can hit it pretty far off the tee. A lot of time I can drive it really far and then just wedge it on the green. Every time I hit my driver down the fairway, it looks like my ball goes far. When I'm pushing my cart down the fairway I realize how much farther my ball goes, especially this year. Last year I hit like 200 max. This year I hit it 245, which is a lot for me. Sophia also works on the mental part of the game. "Staying in the right mindset," she said. "I think 18 holes is pretty long. So concentrating on every shot is important." Looking back, Scrobel remembered when he first thought Sophia was going to be something special. "The thing about Sophia is she is so intrinsically motivated," he said. "Everything she does, she does with laser-like focus and a tremendous amount of passion which equates to becoming a strong golfer. 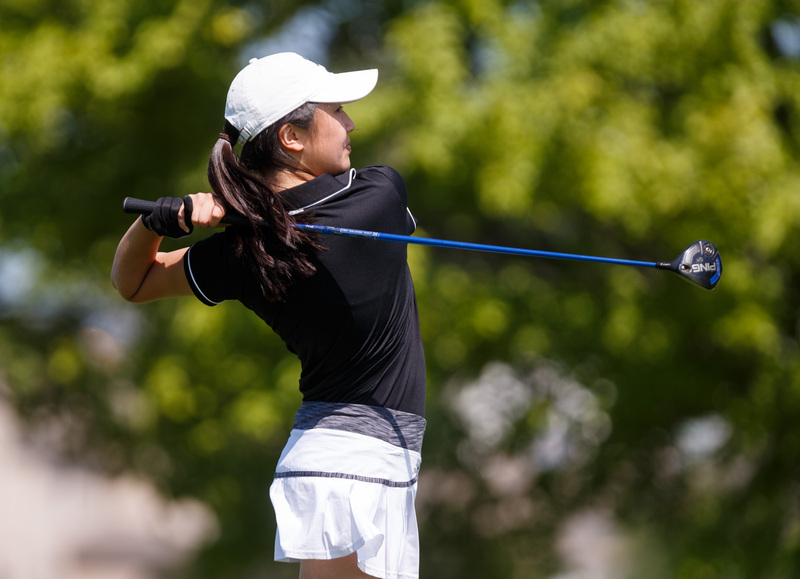 Photo by Alan Herzberg, SportsPhotos LLC --- Sophia Sun earned All-Greater Metro Conference honors four years, including first-team her senior season. "As a coach she is a joy to have at practice," he said. "She is able to be focused. She is able to laugh and giggle and make everyone else around her feel better, even when they've struggled a little bit. "She is one of those charismatic people that no matter what she is going to do in life, she is going to be successful. She is going to make everyone else around her successful just because of the way she makes them feel. She is a very good personality to have out there." Having closed out her career this week at her fourth and final state tournament, Sun found time for some reflection. "There are a lot of times I get sentimental," she said. "Oh it's our last conference match or it's our last tournament at state that I will ever play competitively. I'm looking forward to making the most of it all. "Golf will always be a part of my life. I'm always going to look forward to playing with my dad. He always says it will be nice when I can play golf with business people." Just don't beat them too bad, Sophia, if you want to make a sale. MOST MEMORABLE MOMENT: Beat Franklin at 2016 sectional in a playoff to qualify for state.